Sky Q Review, Is This The Future Of TV? Sky Q is Sky’s new satellite TV service that combines the latest satellite technology with on demand content and a wide range of features. It comes with a completely new range of boxes and software. 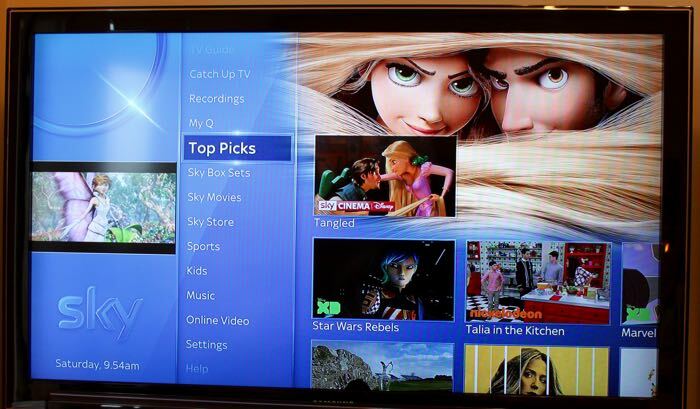 We have been testing out the new Sky Q for the last two months, this has given use a good chance to test out every aspect of Sky’s new TV offering for our Sky Q review. 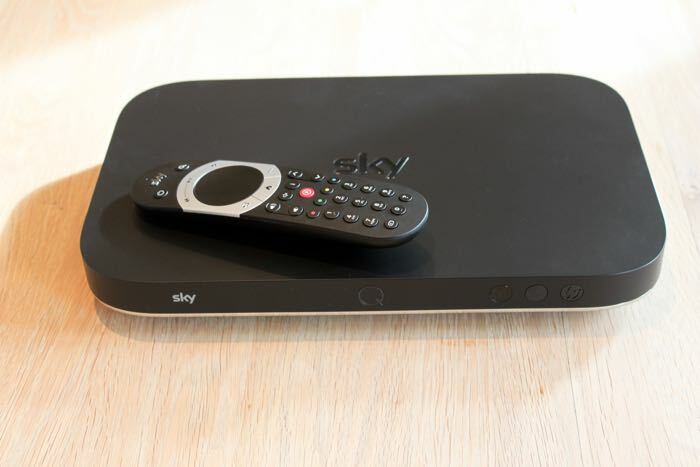 The setup we have tested included a Sky Q Silver box, two Sky Q Mini boxes and broadband from a third party provider. 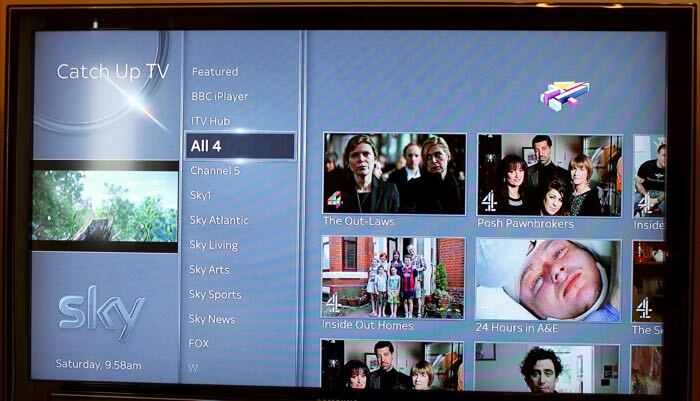 Sky also offers their own broadband in the form of the Sky Q Hub, we did not test this out with our system. What is Sky Q and how much does it cost? 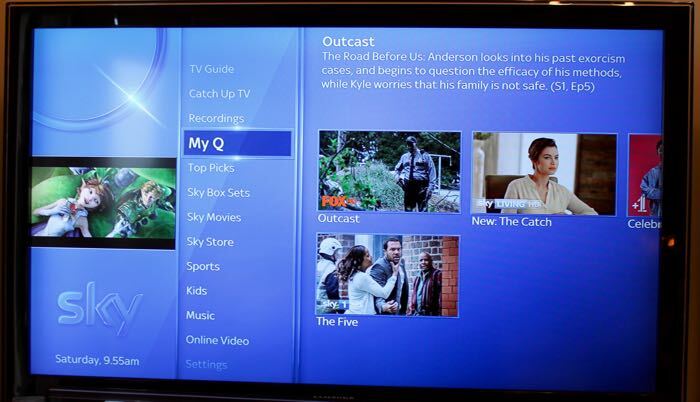 Sky Q is Sky’s new TV service which also comes with the choice of optional Sky Broadband and a range of Sky TV boxes which can be used in different rooms. The system allows you to watch movies and TV shows on your TVs and also your smartphones and tablets. It offers a full multi-room TV service where you can watch different shows and movies in each room all at the same time. Prices for Sky Q start at £44 per month for the standard package and from £56 a month for the Sky Q Silver package. There are also up front costs with each package which start at £99, unlike previous Sky TV offerings you do not own the equipment. Sky has just announced that 4K Ultra HD content will be available on Sky Q Silver from August. Sky Q Review, what hardware is available? 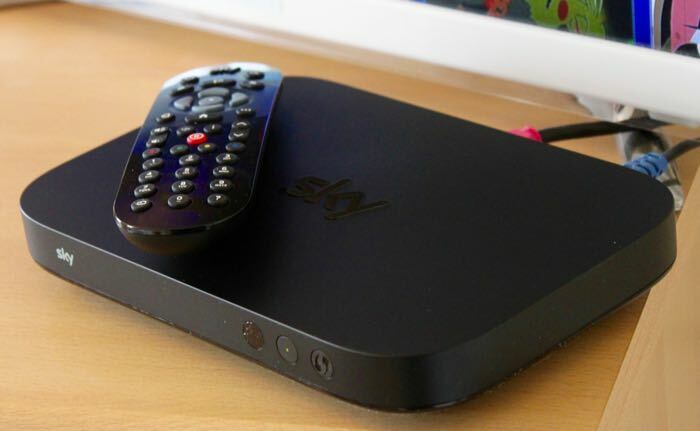 The standard Sky Q package consists of a Sky Q box with 1TB of storage, this allows you to watch TV in one room and also on one tablet in your home. You can record up to 150 hours of shows and movies and it has the ability to record three shows and once and watch a fourth show. The top hardware package is the Sky Q Silver box, this package also comes with an additional Sky Q Mini box for another room and you can have more of these mini boxes for an additional cost. The Sky Q Silver box comes with 2TB of storage and you can use 1.7TB of this to record your content.This lets you store up to 350 hours of shows and movies. 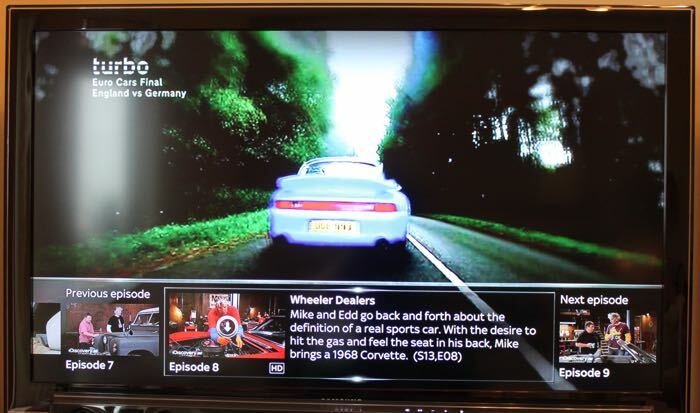 You can record four TV shows at once and then watch a 5th show, this is a major improvement over the old Sky HD+ which would let you record a maximum of two shows at once. 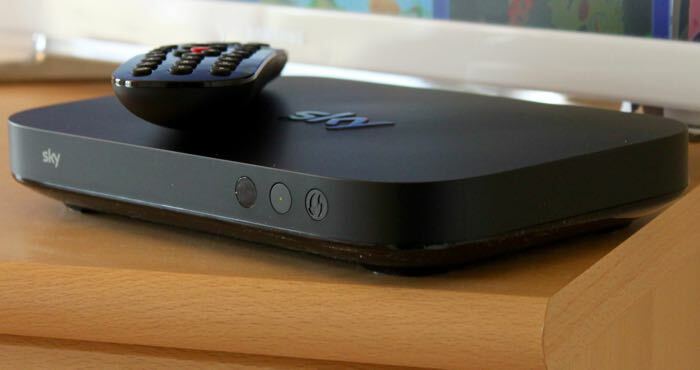 There is also the option to have Sky Broadband with the Sky Q Hub, this turns your Sky Q boxes into WiFi hotspots and actually boosts your WiFi signal around your home. Our Sky Q setup consists a Sky Q Silver box and two Sky Q mini boxes, we do not have the Sky Q broadband instead we have broadband from another provider, this did not cause any issues and the system works flawlessly. 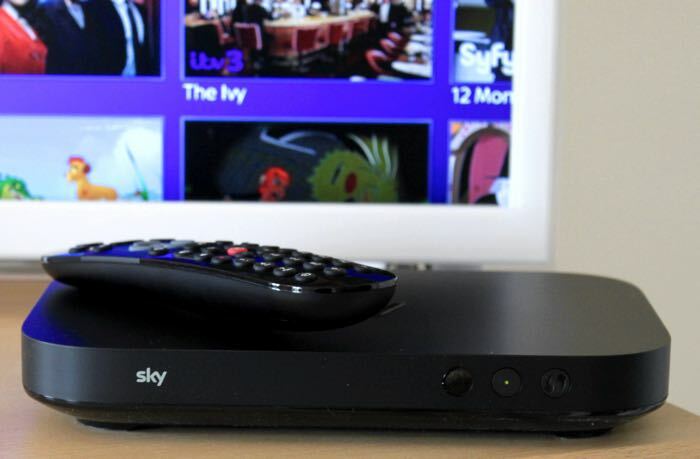 The Sky Q Silver box is a major upgrade over the old Sky HD it comes with a total of 12 TV tuners and these allow you to record 4 TV shows at once whilst watching a fifth. The other tuners are used for the Sky Q Mini boxes and also for the smartphones and tablets for watching live TV from the box. One the older Sky+ HD box you could record two shows at once, this new Sky Q box with the ability to record four shows and watch a fifth is a big improvement. The box is also considerably smaller than the Sky+ HD box and it doesn’t run as hot as the older one did. The Sky Q Silver box has a massive 2TB of storage built in, this gives you the ability to record up to 350 hours of HD shows and movies, this is over five time more than the Sky+ HD box. One of the major new features on the Sky Q Silver box is ‘Fluid Viewing’, this synchronizes your recording with the other boxes in your house. You can start watching a show that you have recorded in one room and then watch it where you left off in another.You can also continue to watch the same show from the same place on your smartphone or tablet. This is a great feature, although it is only available on recorded shows, we would like to see it made available for live shows, this is something Sky could add in the future. There is a way around this though, if you are watching a live show and want to watch it from the same place in another room, all you need to do is hit record and you can then pick up where you left off on another box. 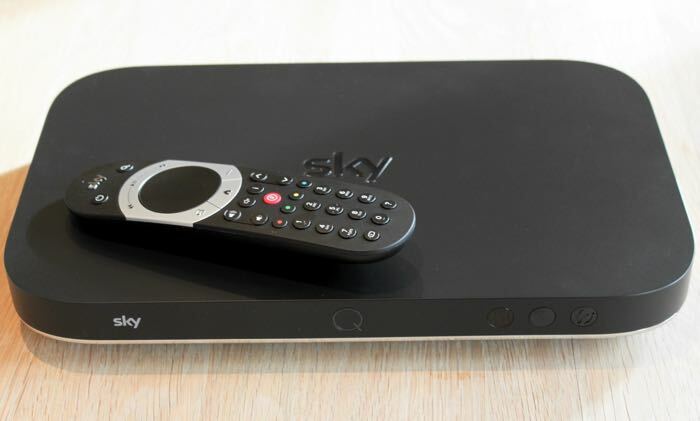 Sky also offer another Sky Q main box, this one comes with 1TB of storage and lets you record three shows and watch a fourth one at the same time. You are also allowed to stream content to one smartphone or tablet around your home. With this you get an extra box for one room in your house, Sky Q Silver gives you two extra boxes. The Sky Q Mini box is designed to be used in another room. 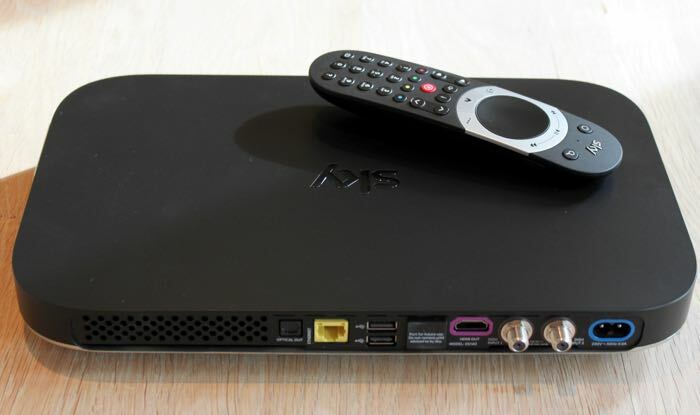 This box is used to stream content direct from your Sky Q Silver box to another TV and it comes with the same menu and a very similar remote to the Sky Q Silver box. Sky Q starts at £44 a month for the 1TB box and £56 a month for the 2TB box, it really depends on what features you want on which one is best for you. The Sky Q Silver comes with all of the features and the Sky Q box lets you record less programs and once and also stream to less devices around you home. 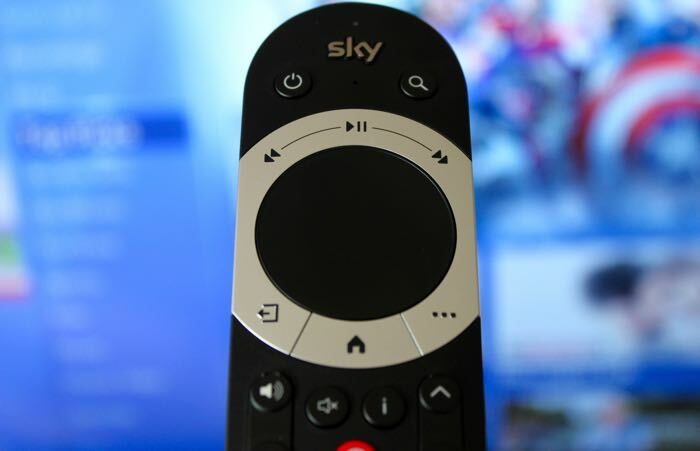 Sky have completely re-designed their remote for their new TV package and the Sky Q remote is a massive improvement over the old Sky+ Remote. It comes with a wide range of features that make is much easier to use and also a lot more user friendly. In the center of the Sky Q Remote is a large round touch sensitive panel, this is used for navigating through menus and it works very well. On and the bottom of this are a number of touch sensitive controls which give you a range of options. On the top there are buttons for fast forward, rewind and play and pause. At the bottom there are a back button, a home button and also a button which launches the built in apps menu. These controls take a little while to get used to, but once you do they are so much better than the controls on the old remote. You can fast forward and rewind easily by moving your finger left or right and when you want to stop and watch you show, you just take your finger off the remote. This is definitely a lot easier than the old remote. 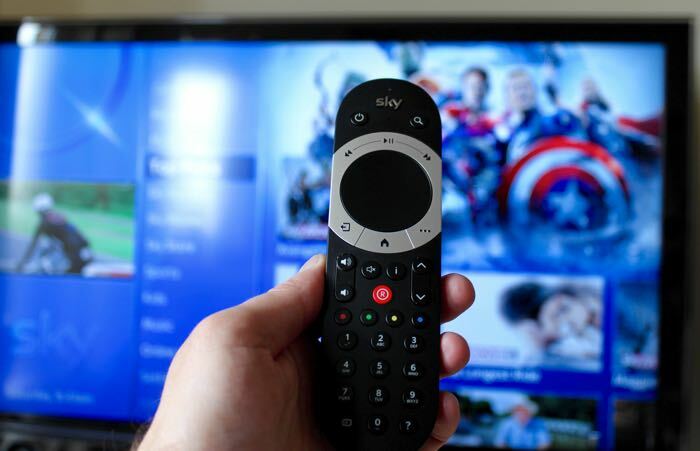 On the side of the remote there is a button for a microphone, this does nothing at the moment,Sky will be bringing voice control to their Sky Q Remote later in the year, we will have more information on this when it is launched. Sky Q comes with a range of built in apps, these are limited to five at the moment, but this is something that could be expanded on in the future. The apps include Sky News, Sky Sports News HQ, Weather, Help and My Photos. 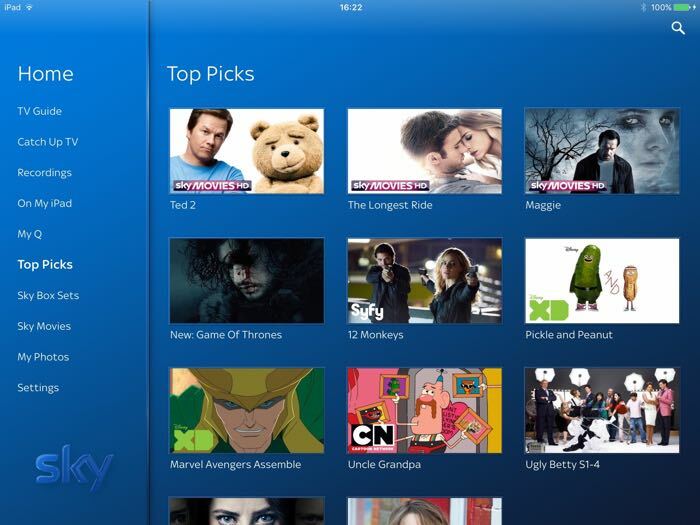 The photos app allows you to look at your photos from your smartphone or tablet on your Sky Q box, this is a feature available on the existing Sky+ HD boxes. The Weather and news apps show you more details on the news and weather and the Sky Sports News HQ app give you information on lots of current sporting events. 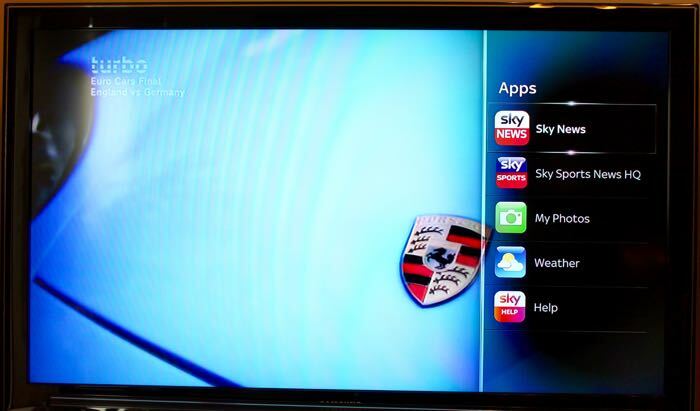 It will be interesting to see how Sky expands their apps in the future. As well as apps Sky also has built in TV streaming from other providers, you get access to streaming from the BBC iPlayer, All 4, Channel 5, Fox and all of Sky’s own channels, which lets you watch on demand content on your Sky Q devices. Both options of Sky Q allow you to stream content from your Sky Q or Sky Q Silver box direct to your smartphone or tablet. This is a really cool feature that gives you the option to watch live TV and also your recordings on your device. You can stream recorded shows direct to your smartphone or tablet, in order to do this you need to be connected to your WiFi network around your home. If you want to watch shows and movies that your have recorded on your smartphone or tablet away from the home then you will need to download these to your device. This is available for most TV shows and movies, although there are some exceptions with providers who already have their own streaming and download apps, for example this does not work with shows you have recorded from the BBC due to rights issues, although they can be streamed to your device. The Sky Q app on your smartphone or tablet comes with a wide range of feature and it has a number of improvements over the Sky Go app, the new app integrates seamlessly with the Sky Q system. The new Sky Q comes with a completely redesigned interface that is a lot easier to use than the menu system on the Sky+ and Sky+ HD boxes. There are a ton of different menus that give you access to a wide range of content. The menus can be easily navigated using the Sky Q Remote. Sky have definitely given the user interface a more up to date look, more in line with offering from Netflix and Amazon Prime, although it appears to be more user friendly than current streaming services. The menus are the same on the Sky Q Silver and Sky Q mini boxes and also on the smartphone and tablet apps. Once you have been using the new menu for a short while, everything feels friendly and easy to use, it is definitely a massive improvement over the older Sky menu. 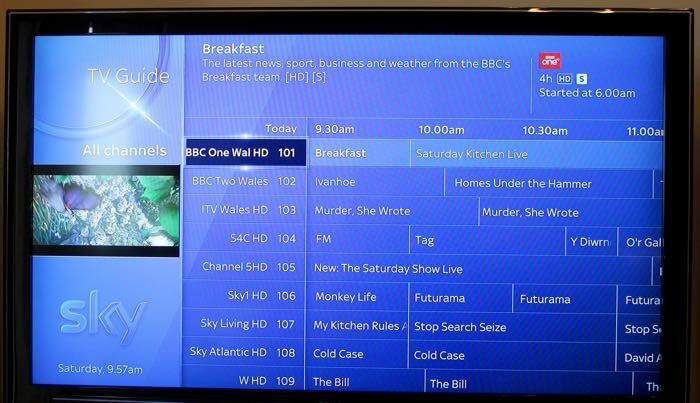 The menu is split into sections, you have a TV guide at the top, catch up TV, your recordings, My Q, top picks, Sky Cinema, sports, box sets. the Sky Store and much more. Each of these sections expands with a further menu that gives you a massive range of content to chose from. One new feature is called My Q, this is a section which will recommend TV shows and movies based on your viewing habits and also what you record. It takes a few days to learn what sort of content you like, but it is a great feature and shows you content that you may have otherwise missed. The Sky TV guide will be familiar to existing Sky+ users, it shows you what is on at the moment and also what shows are coming in the future. Other new features include and updated program synopsis when you pres ‘i’ on your remote. You can now scroll up and down the other channels and get a picture in picture preview of what is on. There is also the ability to scroll left and right to see other shows in the series that you are watching, this is particularly useful if you are watching a box set as it is easy to jump to the next show in the series. I have been a Sky subscriber for a number of years and have used the Sky+ HD boxes and the new Sky Q is a massive improvement over their previous offering. Sky Q comes with a wide range of new features and Sky has built a great platform in terms of their software and hardware that makes the system really user friendly and a lot easier to use than their Sky+ system. Some of the features that I really like and use regularly are the ability to record multiple programs at once, this is a great feature and there are so many great shows on at the same time, this comes in really handy, I regularly end up recording three of four shows at the same time, so this feature is a big improvement over the Sky+ system. 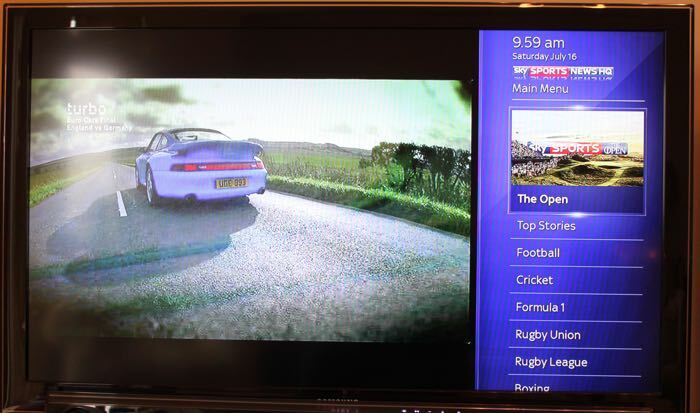 The new user interface and menu have also made the new Sky Q a lot easier to use than the older system. Sky have given the new menus a strong focus on streaming content, this is great as they have a massive library of on demand content available to stream and download to your box. The new menu brings this content to the front and makes it a lot easier to discover TV shows and movies that you may have otherwise missed. Overall the new new Sky Q system is impressive and it looks like Sky have build a solid platform in terms of both hardware and software they can build on in the future. It does cost more than the Sky+ system, but it is definitely worth the extra cost. 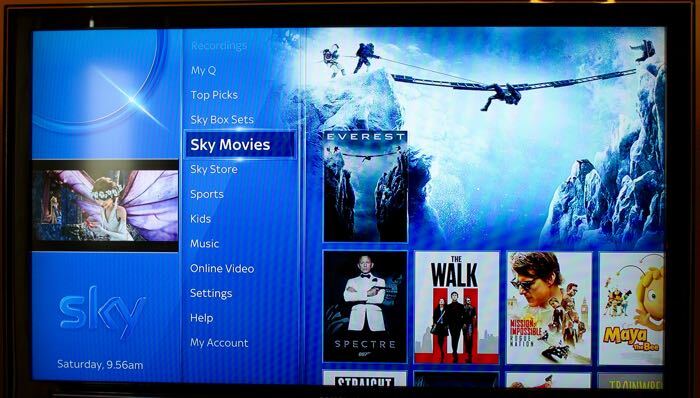 If you are an existing Sky+ or Sky+ HD users then it is worth looking into upgrading to the new Sky Q system as it comes with some impressive features, great software and impressive hardware. Sky have really improved on their TV offering with their new Sky Q system, what you get is all of Sky’s excellent content in a modern package. 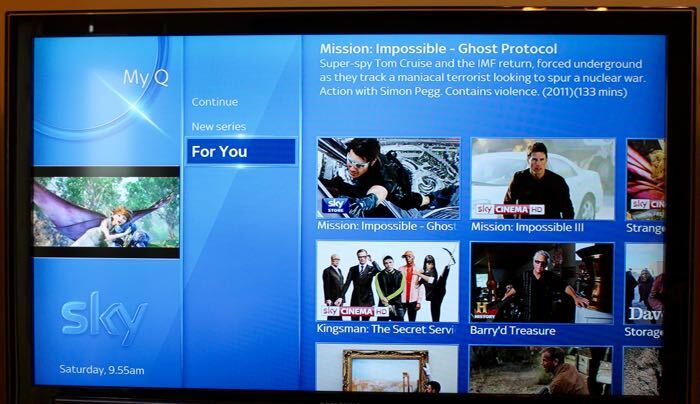 You can find out more information about the new Sky Q system over at Sky.